Although March as begun, the weather reminded us on Sunday that winter is not over yet. Here is one last photo I took of the effects of the storm. 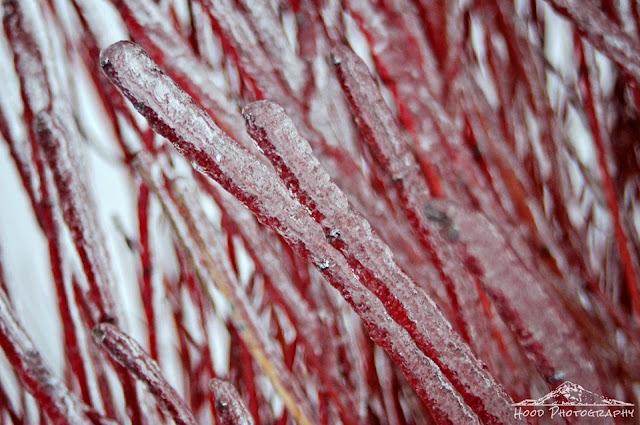 These icy branches are just an example of the hiemal scene in my neighborhood that day. I loved their color and textures. I like the bright red color of the branches. Hope your neighborhood has thawed out by now. Every season has its own beauty, and its nice to see this last of winter! I hope you do thaw out soon. I had to look up the word "hiemal." (relating to winter) I learned a new word and do appreciate your photo! The newspapers here reminded us today that March gives us a quarter of the average annual snowfall, so it's far from over. they kind of look like candy! Lovely, but may the ice melt soon! Beautiful macro and a great word. They keep forecasting ice here but not has appeared, yet. A good H word and a new one to learn.